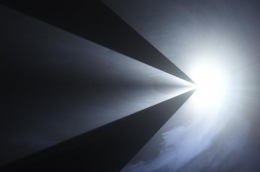 Sean Kelly is delighted to announce a major exhibition of new work by Anthony McCall – Leaving (with Two-Minute Silence). 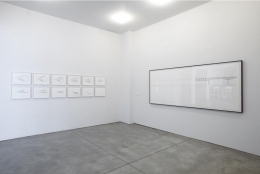 The opening will take place on Thursday, December 10th from 6pm until 8pm. The artist will be present. 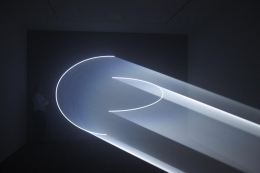 McCall creates "solid light" works – digital videos of meticulously choreographed intersecting lines and curves which are projected in darkened haze-filled rooms, creating three-dimensional sculptural forms constructed from light. 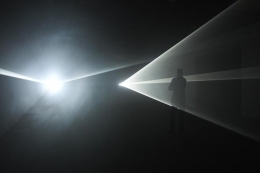 When the viewer moves in and out of the projected light beams, they are forced to reconcile their perceived sense of a three dimensional object in space with the actual reality of the mutable properties of light. Leaving (with Two-Minute Silence), McCall's newest work, will be installed in the main gallery. This will be his first work in thirty years to include sound, which was produced in collaboration with the musician and composer David Grubbs. 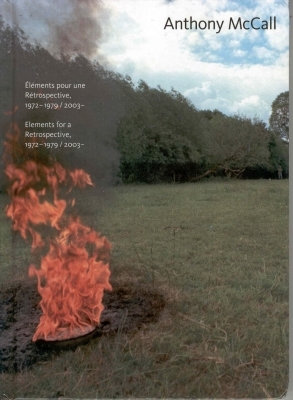 The piece consists of two, spatially parallel, projected forms. The first form starts as a complete ellipse, which is systematically cut away until nothing is left. The second form starts with nothing and systematically grows into a complete ellipse. The sonic environment operates as a just-audible 'shroud' which is built from two opposing sound-spaces: the traffic of the city emerging from one side of the space, the liquid sounds of a city harbor from the other. At one moment during each cycle, the motion freezes and the sound vanishes, to produce a transient moment when time stands still. In addition, a second light projection piece, Meeting You Halfway II, will be installed in gallery two. This will be the first time that two full-scale installations of McCall's work will be shown simultaneously at the gallery. 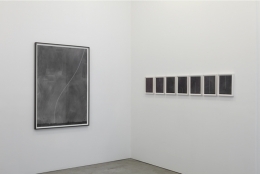 Gallery one will feature new works on paper, including studies for major upcoming public commissions such as McCall's newly awarded Olympics commission for Projected Column, to be installed in the Mersey docks near Liverpool during the 2012 Games. Drawings for his Crossing the Hudson project – a proposal consisting of a 365-day structure for the gradual lighting of a disused railroad bridge on the Hudson River - will also be exhibited. 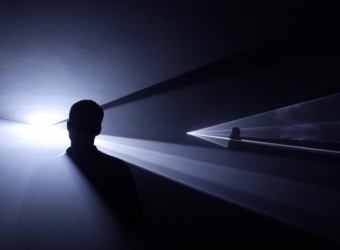 Anthony McCall's work is included in many major public collections worldwide including: the Tate Gallery, London; the Museum of Modern Art, New York; the Musée National d'Art Moderne, Centre Georges Pompidou, Paris; the Whitney Museum of American Art, New York; the Museu d'Art Contemporani de Barcelona; and the Museum für Moderne Kunst, Frankfurt. 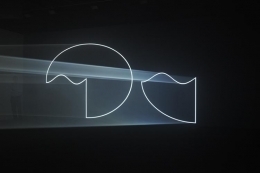 His most recent exhibitions include Breath [The Vertical Works] at the Hangar Bicocca, Milan, the Creative Time installation Between You and I, at St. Cornelius Chapel on New York's Governor's Island this summer, and the currently running Nu/Now: Anthony McCall at the Moderna Museet, Stockholm.